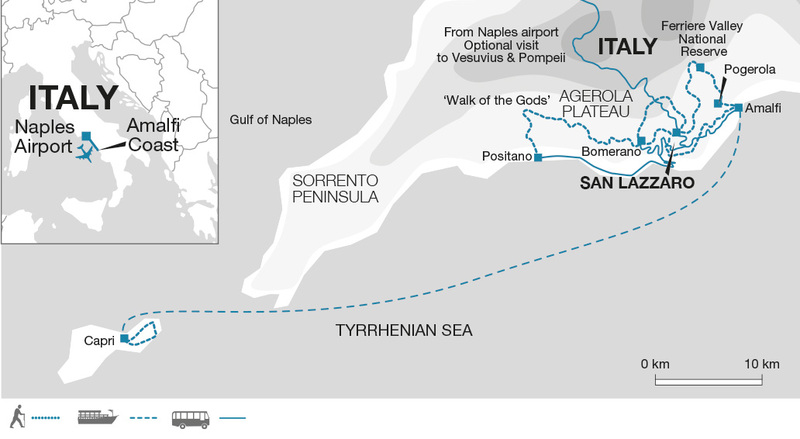 This relaxed walking holiday explores the trails of the spectacular Amalfi Coast from clifftop hikes to woodland walks. There's also time to discover the towns of Amalfi and Positano and the island of Capri. You'll stay with an Italian family at their peaceful farm overlooking the Mediterranean and enjoy tasty home-produced organic food and wine. Walk between three and five hours each day, following footpaths and old mule tracks between villages. Some of the terrain is rough and stony underfoot and three of the walks involve long descents of steep steps. Any of the walks can be opted out of. Graded as Easy to Moderate as there is a mix of easy and moderate walks. Itineraries on some departure dates may differ. Services of an Explore Tour Leader / qualified English-speaking trekking guide and driver(s).